According to the GitHub page – https://github.com/raphaelcruzeiro/jquery-notebook – it is relatively new (posted to GitHub only about 2 months before this post). As the name says, it is dependent on JQuery. Also, it uses FontAwesome for the icons in the context bubble. So you have to comfortable with those two dependencies for this library to be useful to you. And then you create the element that you want as your WYSIWYG editor. In this example, I am using a DIV element. You will need to add all the attributes of the DIV element for the editor to render correctly. <div class="editor jquery-notebook" data-jquery-notebook-id="1" editor-mode="multiline"
select a part of this text and don't forget to try the basic text editor keyboard shortcuts. Once you’ve got your scripts, css and element in the page, then you need to add a small block of JQuery to the bottom of your page. This script block tells the page to make the DIV a JQuery Notebook. It does this by using the class selector. See what I mean here. And there you have it. 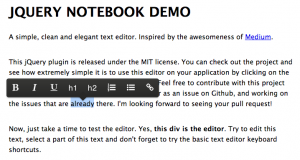 A HTML editor with a nice interface. Be sure to check the GitHub page for some of the configurations available. Here is a pen I made. The pen cuts away all the other scripts and stylesheets so you can easily see the minimum libraries required – http://cdpn.io/uIHhr.